"Clifton takes his years as a proven industry professional and converts it in writing that should become a part of any hospitality security director’s professional library. This book will demonstrate to the reader what a true professional security director is and ways to become one." "Darrell has produced a magnificent compendium covering all aspects of hospitality, entertainment, and tourism security. A must-read for those entering the hospitality security industry after college or from law enforcement. The book serves as an excellent reference resource for the seasoned hospitality security professional." "Darrell’s vast knowledge and experience show through in his book. Hospitality Security is a challenge given its many moving parts; however, Darrell has created a road map for success that can be used at all levels of management and/or discipline. The book should be read by every operational manager to ensure their property is protected from the many forms of risk." "Very well structured, compiled, and written. 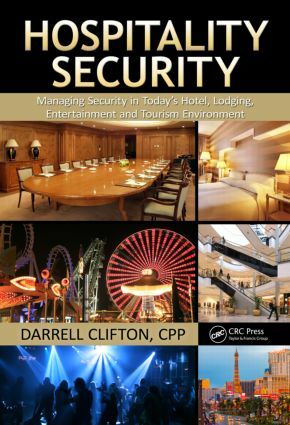 Darrell Clifton's book, Hospitality Security is a tour de force … a landmark book in the hospitality industry and will remain so for many, many years to come." "An excellent resource for every security practitioner … Those with security responsibilities in the hospitality industry would certainly benefit from the author's experience regarding "best practices," but I recommend it to every security professional."